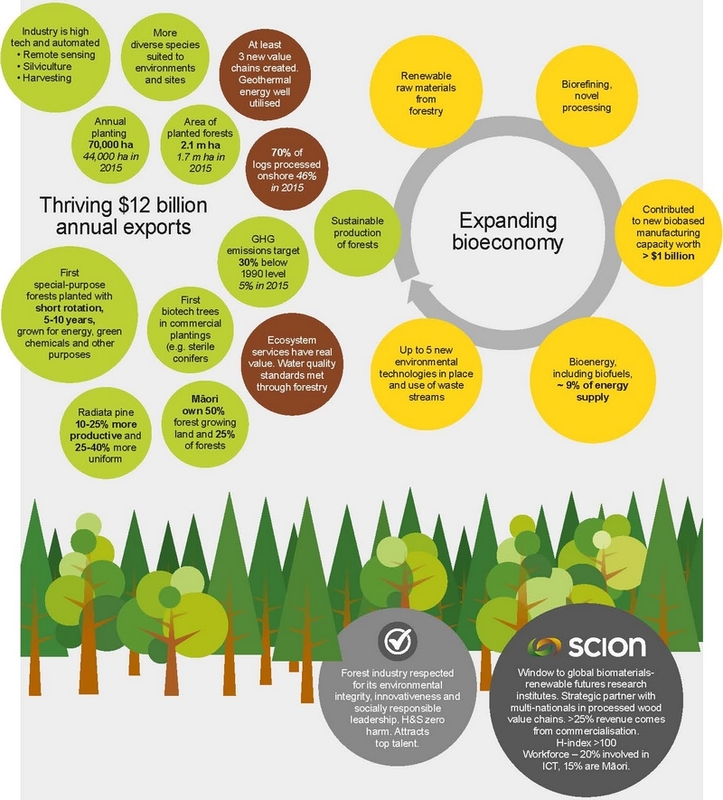 Scion is an integral part of New Zealand’s forest industry, contributing scientific research, technology development and other services throughout the value chain. Forestry is a major part of New Zealand’s land use and economy. The forest industry is based around sustainably managed exotic plantation forests, covering 1.7 million hectares – about 7% – of New Zealand's land area. In the year to June 2016, commercial forestry contributed over $5 billion annual gross income to the economy, about 3% of GDP. Wood and wood products are the country’s third largest export earner after dairy and meat, and some 20,000 people are employed throughout the forestry value chain. 1. What trees grow in New Zealand’s forest plantations? Douglas-fir (Pseudotsuga menziesii) – 6% of plantation area. Radiata pine and, to a lesser extent, Douglas-fir, have benefited from many decades of investment into genetics and breeding, plantation management, harvesting, and processing. As a result, New Zealand’s plantation forests and wood processing sector are advanced and highly productive. Eucalyptus and other species - cypresses, redwoods and a range of other exotic and indigenous species - make up the remaining 4% of the plantation area. These species are now receiving research and development investment and are becoming the focus of new initiatives to increase the diversity of the forest estate and wood products industries. 2. Who owns New Zealand’s planted forests? New Zealand’s plantations are largely privately owned - some 94.5% of planted forests is in private hands. The industry is dominated by a relatively few owners of large plantations, including a number of overseas owners. 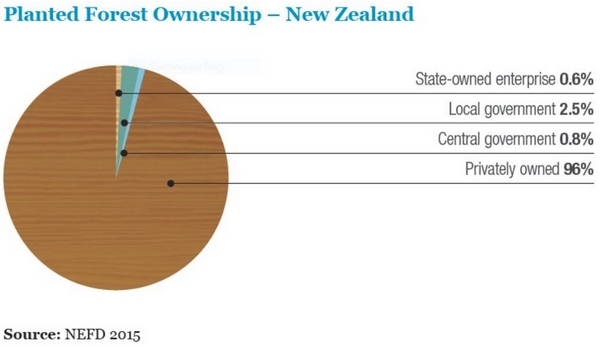 Over 1.1 million hectares (65%) of New Zealand’s plantation forest estate is owned by less than 20 companies. Māori are increasingly featuring in large-scale plantation forest ownership, as land is handed back to Māori corporations as part of Treaty of Waitangi settlements. At the other end of the spectrum, there are many thousands of owners of small areas of trees – these include farm foresters and private investment owners. 3. What happens to the trees when they are harvested? The logs that are exported go ‘over the wharf’ – that is, they are transported by ship from New Zealand’s major ports to many countries around the world for processing and re-sale. In 2015, the total value of log exports was over $4.7 billion. Some 38% by value of all log exports went to China. Other significant markets for New Zealand-grown logs include the USA, Indonesia, Taiwan, Thailand, the Philippines, Vietnam and Malaysia. New Zealand’s forest owners pay a levy on all harvested timber. This levy is collected by the Forest Growers’ Levy Trust. The money is used to fund research and other industry good activities such as biosecurity and health and safety initiatives. 4. What are plantation forestry’s environmental credentials? New Zealand has a number of controls and initiatives to ensure forestry plantations are managed with due regard for the main environmental criteria it impinges on - soil, water and aquatic habitats. Over 50% of the total plantation estate is certified under internationally accredited certification schemes. FSC and PEFC are the two international schemes operating in New Zealand. A number of guidelines and standards also exist to help forest managers protect natural resources; these are widely promoted and supported by the forest industry. 5. What about forests and climate change? Plantation forests play a key role in New Zealand’s greenhouse gas emissions profile. By removing carbon dioxide (CO2) from the atmosphere, forests offset emissions of carbon dioxide by other sectors such as agriculture, manufacturing and transport. Forests act as carbon sinks or reservoirs. As they grow, trees absorb or ‘sequester’ carbon as CO2 from the atmosphere and store it in their roots, stems, branches and leaves. All carbon stored by trees is eventually returned to the atmosphere in what is called ‘the carbon cycle’. In natural forests, the carbon is stored until the trees die and decompose. In plantations, the carbon is stored until the trees are harvested. When a plantation forest is harvested, the stored carbon is transferred to the products that are made from the timber, and very gradually returns to the atmosphere over time as these products break down. Some carbon is also left in the forest at harvest, for example in roots and harvest debris. This carbon also gradually returns to the atmosphere as the material decomposes. Much research has gone into understanding how much carbon is stored by New Zealand’s plantation (and indigenous) forests as they grow: this is now well understood. Less is known about the rate at which the carbon returns to the atmosphere from timber products. New Zealand’s forest owners have the option of joining the NZ Emissions Trading Scheme. This gives them the opportunity to account for the carbon stored in their trees, and trade in carbon credits. 6. What jobs are there in the forest industry? Recent statistics indicate that around 7,000 people are employed in growing and harvesting trees in New Zealand, and a further 11,000 work in wood processing. Mechanisation and the use of technology are increasing in all aspects of forestry and especially timber processing. 7. Where can I go for education and training? Undergraduate and post-graduate courses and further research. A range of technical and management qualifications in forestry operations and wood processing. Distance and e-learning courses in forestry. ‘On the job’ training throughout the value chain, including apprenticeships. 8. What does the future look like for New Zealand’s forest industry? The future for New Zealand’s forest and wood processing industries will be greatly affected by a range of global trends. Scion reviews and analyses trends, economic and social drivers that will affect the forest industry. This analysis is summarised in our Statement of Corporate Intent. 9. Who are the main organisations involved in the New Zealand forest industry? 10. What are the best sources of information about New Zealand’s forest industry? 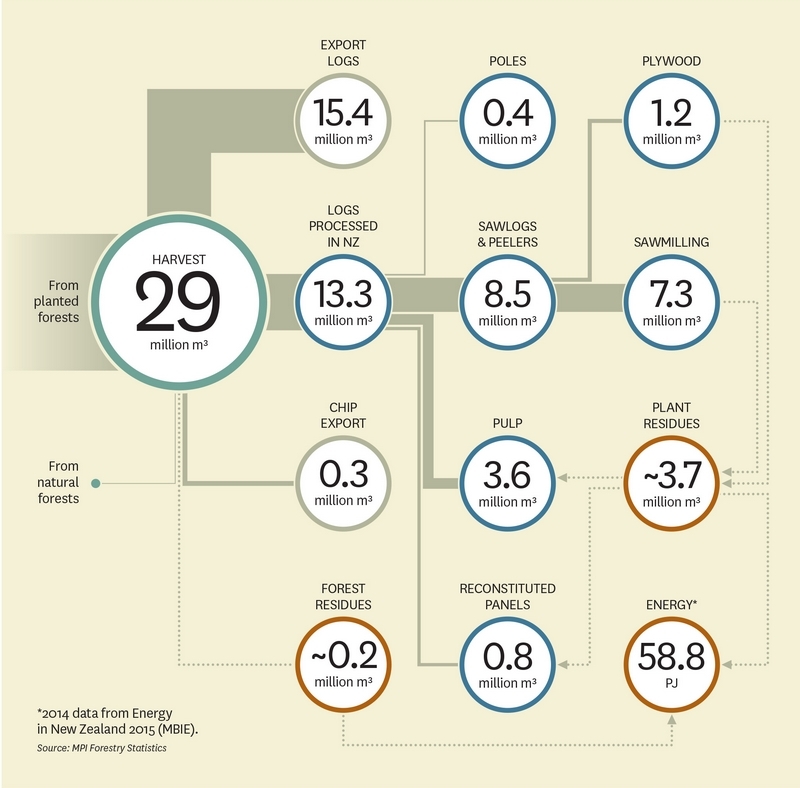 Forestry Facts and Figures – a concise annual summary of the NZ plantation forest industry. NZ Planted Forests Portal – a major resource of economic and environmental information. Te Uru Rākau – Forestry resources – detailed long-run statistics associated with NZ forestry, regularly updated. Te Uru Rākau – Forestry New Zealand.